Known for his signature bushy moustache, ever-present cigar and wildly irreverent manner, legendary comedian Ernie Kovacs actually had his start in the entertainment world as a singer, but his ability to both devise and improvise delightfully strange comic scenarios soon sent him off in a wholly different direction. After trying his hand at various mundane jobs, Kovacs found his home on television and honed his talent with a number of hosting gigs. Whether he was instructing housewives on how to spice up their evening meal or reporting the local weather, Kovacs always worked his unique brand of irreverence into even the drabbest show premise. When finally granted a program in which he could let his inner madman run wild, Kovacs concocted some of the zaniest and most original comedy of his day, best illustrated on "The Ernie Kovacs Show" (CBS/NBC, 1952-56). One of the key elements of his humor was its unexpected and incongruous nature, a natural outgrowth of his frequent ad-libbing, but also representative of his truly unique sensibilities. Kovacs' blackouts were quite experimental for the time and he would be credited with inspiring a number of later programs, particularly "Rowan & Martin's Laugh-In" (NBC, 1968-73), as well as serving as role model for future comics with their own peculiar perspectives. Never short of unusual ideas and ways to somehow pull them off, Kovacs was incredibly inventive and a true trail blazer whose importance to the worlds of comedy and television could never be underestimated. Born in Trenton, NJ on Jan. 23, 1919, Ernest Edward Kovacs was the son of Hungarian tavern owner Andrew Kovacs, who also operated as a highly successful bootlegger during Prohibition. After his parents separated, Kovacs and his mother lived together in a one-room flat divided down the middle by a blanket. He often played hooky during the early days of his education and was not all that much more dedicated in high school, but he grew to love singing operettas and earned an acting scholarship at The American Academy of Dramatic Arts. The youth toiled hard in stock company roles and finally scored significant attention when he participated in a Broadway talent search, but this did not immediately lead to a life in show business. He instead performed various jobs, including working in a drug store and as a disc jockey on radio station WTTM; later, he even wrote a newspaper column, "Kovacs Unlimited," for a local newspaper from 1945 until 1950. Early in his stock company days, Kovacs drove himself so hard that he suffered a complete physical and mental collapse, spending a year and a half at various hospitals. His work ethic remained strong after recovery, however, and by 1950, Kovacs had relocated to Philadelphia, PA, where he brought his cracked sensibility to the local programs "Pick Your Ideal," "Deadline for Dinner," and the morning show "3 to Get Ready." These gigs eventually led to "The Ernie Kovacs Show" (CBS/NBC, 1952-56), a daily TV show first in Philly and later New York City. The series went through various incarnations and timeslots, and Kovacs' consistently wild ideas were quite unlike anything on TV at the time, particularly in the way he exploited the visual aspects of the medium - including using rudimentary special effects, like carefully positioned mirrors and titled sets - to heighten his comedy. One critic wrote that Kovacs' sense of humor could not offend the network, sponsors or the public because no one understood it. Even if not everyone was on his wavelength, Kovacs' program developed a devoted following, with people tuning in to see characters like German disc jockey Wolfgang Von Sauerbraten, Hungarian chicken king Colonel Janos Kentucky Fried Paprikas, nearsighted poet Percy Dovetonsils, and alcoholic magician Matzoh Heppelwhite. His best remembered sketch, The Nairobi Trio, featured apes in, of all things, derby hats and beautifully demonstrated the humor that Kovacs was able to mine from seemingly innocuous pieces of music. Comedienne-singer Edie Adams was a regular standout on the program and became Kovacs' second wife. Perfectly in sync as performers, they were also well matched in real life and the marriage offered Kovacs and his two young daughters the support they needed after the comedian's break-up with his previous spouse, Bette, who was legally declared mentally unfit to be a mother. Given visitation rights, Bette later kidnapped the girls, leading to an extended fight on Kovacs' part to get them back. Even with this domestic drama and his demanding work schedule, Kovacs managed to also make regular appearances on various other shows that decade, like "I've Got a Secret" (CBS, 1952-1967), "What's My Line?" (CBS, 1950-1967), "The Jack Benny Program" (CBS/NBC, 1950-1965), and "Tonight!" (WNBT-TV/NBC, 1953-57), the precursor to "The Tonight Show," where he served as a guest host. With the accolades starting to pour in, Kovacs found himself featured on an April 1957 cover of no less than LIFE magazine. This notoriety never translated into popularity for Kovacs on the level of contemporaries like Milton Berle or Jackie Gleason, but his ability was so evident to higher-ups in the industry that he was soon extended movie offers anyway. Kovacs made his motion picture debut with a cameo in the comedy short, "Showdown at Ulcer Gulch" (1956), and he soon became known for playing comic villains - typically captains in some branch of the military - beginning with "Operation Mad Ball" (1957). Further feature roles followed in "Bell Book and Candle" (1958), "It Happened to Jane" (1959) and "Our Man in Havana" (1959). By 1960, Kovacs was thoroughly enjoying the life and perks of being a star, spending as much as $20 a day on cigars and becoming known for his wild gambling. Earning $200,000 a film, he and Adams lived in a 17-room, $600,000 home with among other things, an indoor waterfall and a turntable driveway. Kovacs was given a star on The Hollywood Walk of Fame in 1960 and appeared in four more movies that year alone, including the big-budget John Wayne vehicle "North to Alaska" and the all-star comedy disaster, "Pepe." 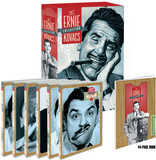 In the fall of the following year, everyone's comedy hero launched into a series of specials for ABC also called "The Ernie Kovacs Show" (1961-62), which were very well received. However, at the peak of his fame and power, things were about to take a tragic turn. While driving home from a star-filled baby shower for Milton Berle's wife on Jan. 13, 1962, Kovacs lost control of his car, evidently due to wet road conditions, and hit a utility pole; he died from extensive head and internal injuries. Only a few days before his death, Kovacs had finished filming "Medicine Man" (1962), a comedy pilot for CBS, which was subsequently never broadcast. He was posthumously awarded the 1961 Best Director award by The Director's Guild of America in recognition of his work on "The Ernie Kovacs Show." At the time of his death, Kovacs, who, though he had made a fortune in his lifetime, had no sense of how to manage the money he was raking in and owed several hundred thousand dollars to the IRS. A grief-stricken Adams subsequently paid off the debt, and wisely also acquired all rights to his surviving videotaped television shows from ABC - which, remarkable, had started erasing them in order to reuse the tapes. A Kovacs biography, Nothing in Moderation (the epitaph on his tombstone) was published in 1975 and in 1984, a TV-movie, "Ernie Kovacs: Between the Laughter" (ABC) was produced, with Jeff Goldblum playing the comedian. While a good portion of the film celebrated Kovacs' talent, much was devoted to his first marriage and the kidnapping. Sadly, Mia Kovacs, the only child he had with Edie Adams, also died in a car accident in 1982. Betty Lee Wilcox. Dancer. Born c. 1924; married on August 13, 1945; separated in 1950; divorced c. 1952; mother of Kovacs' two older daughters; Kovacs retained custody of children after divorce; in 1953 she disappeared with daughters for close to two years; Kovacs was reunited with them in 1955. Edie Adams. Singer, actor. Married from September 12, 1954 until his death; mother of youngest daughter. Andrew Kovacs. Bootlegger, restaurateur. Separated from Kovacs' mother in 1936. Mary Kovacs. Restaurateur. Separated from Kovacs' father in 1936. Thomas Kovacs. From father's first marriage; born c. 1911. Betty Kovacs. Born c. 1947; mother, Betty Wilcox. Kippie Kovacs. Born c. 1949; mother, Betty Wilcox. Mia Susan Kovacs. Born on June 20, 1959; mother, Edie Adams.